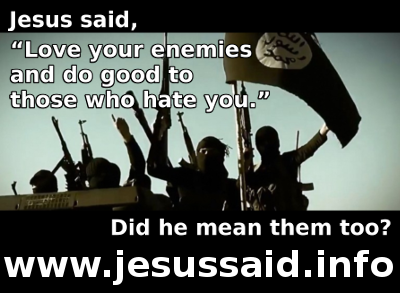 Jesus Said: Love your enemies. Did he mean them too? Do you think of yourself as good and loving? Have you considered Jesus’ standard of love? Jesus said that loving those who love you is not good enough; even sinners do that. What really counts for something is when you love those who hate and hurt you. Jesus established God’s kingdom here on earth. It is unlike the kingdoms and nations of this world. The nations of this world are focused on protecting what their citizens have here on earth. In contrast, God’s kingdom is only open to those who are willing to give up hatred, even towards their enemies, and do good to all people, even if it costs them their possessions, their friends, their family or their lives.